GET YOUR WORK DONE COMFORTABLY! SAY GOODBYE TO NECK PAIN AND TENSION FROM ALWAYS LOOKING DOWN AT YOUR LAPTOP! WHY BUY EXECUTIVE OFFICE SOLUTIONS? We provide you only the highest quality products and strive for the best customer service. We are here to assist you however we can, and fully intend to make your work easier through our premium portable desk. There Is no risk - If you do not like the product, there is a 100% money back guarantee ....So scroll up to the top and click the "ADD TO CART" button now, before the sale ends!! 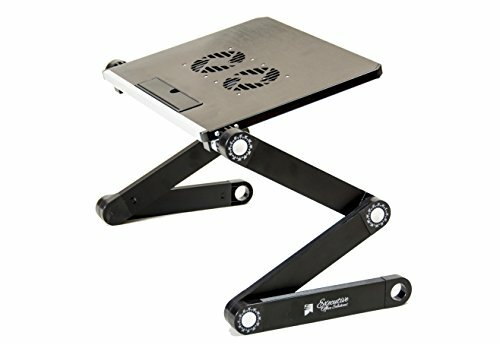 LIGHT WEIGHT, HIGH STRENGTH ALUMINUM TRAY, STURDY LEGS - Makes Carrying Easy and Holds Your Computer Firm and Steady. OUR SMALLEST AND LIGHTEST STAND AVAILABLE - Recommended For Laptops up to 15 Inches, This Stand Is Small Enough To Take With You To Work, School, Coffee Shops, or Where Ever You Need It! MULTIPLE USES - Table Can Also Be Used For a TV Dinner Tray, Sound Equipment, Projector, Standing Desk, Book Tray, Writing Desk, and Tablet Holder. If you have any questions about this product by Executive Office Solutions, contact us by completing and submitting the form below. If you are looking for a specif part number, please include it with your message.